Over the past few weeks, rumors have been doing rounds that a Samsung Galaxy S7 Active is in the making and it will soon be announced to the public. As it seems, the South Korean company, together with the usual suspect – AT&T – are in the works to announce the successor to last year’s Samsung Galaxy S6 Active. A model that begun with 2013’s Samsung Galaxy S4 flagship, it is now becoming some sort of a trend to have a rugged version of the flagship Galaxy S series. It happened with Samsung Galaxy S5 and last year’s S6. Now, there are new leaks coming from Samsung Vietnam, showing off the upcoming Samsung Galaxy S7 Active in the usual rugged body that has made the Active version such a popular phone for many outdoor lovers. Despite the rugged nature, the Galaxy S7 Active will still keep the same rear snapper and flash on the rear with the addition of a fingerprint sensor. On the front Samsung has placed three navigation buttons. As for the rugged body, the phone gets thick corners and drops the capacitive keys in favor of physical keys for Back and Recent Apps. The rear of the Active also comes with a digital camouflage print, which makes the phone even more perfect for the outdoor environment. AT&T has taken care of all previous models of Samsung Galaxy S Active models and as mentioned earlier, this year’s Samsung Galaxy S7 Active will remain exclusive to this carrier. This is true thanks to the AT&T logo that appears on the back of the leaked photo, just below the camera. As for now, it cannot be confirmed whether Verizon, Sprint, and T-Mobile will bring the S7 Active model to their customers, but this is highly unlikely. Last year’s Samsung Galaxy S6 Active kept most of the internals that the flagship S6 packed. This is what we expect to see when Samsung Galaxy S7 Active is finally announced. The flagship Galaxy S7 packs a Snapdragon 820 SoC, a RAM of 4GB and onboard storage of 32GB, with a microSD card slot included. IP certification was one of the features that differentiated last year’s Galaxy S6 and S6 Active. But with this year’s flagship already featuring IP68 rating, it is possible that Samsung might go for military-grade protection in order to offer better protection than what the glass and metal used on the S7 can manage. 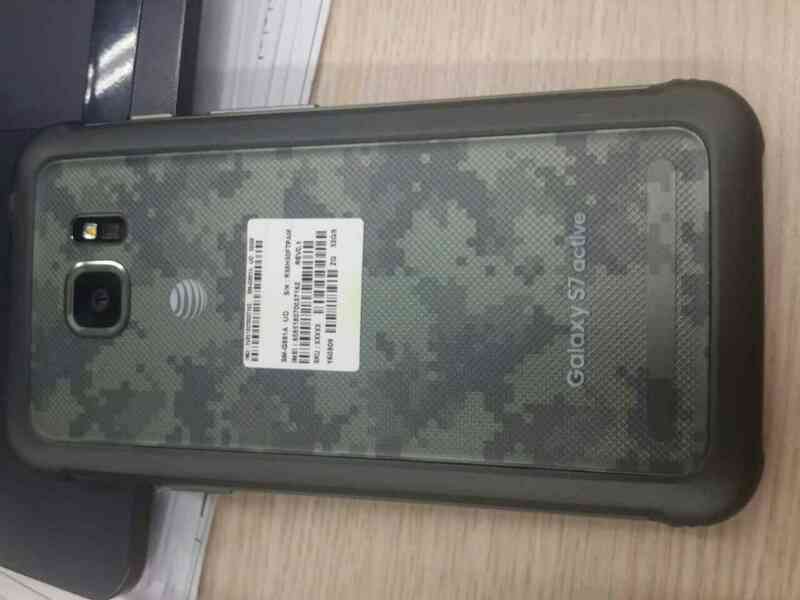 What do you think about the upcoming Samsung Galaxy S7 Active?